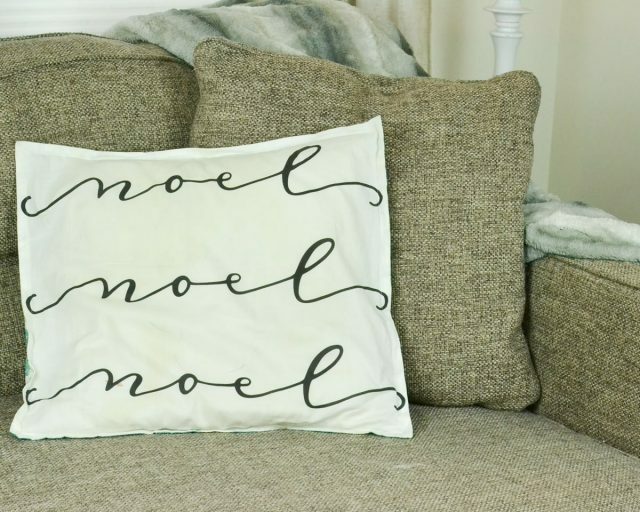 Christmas pillows are so fun to snuggle with, and they bring in the holiday spirit. 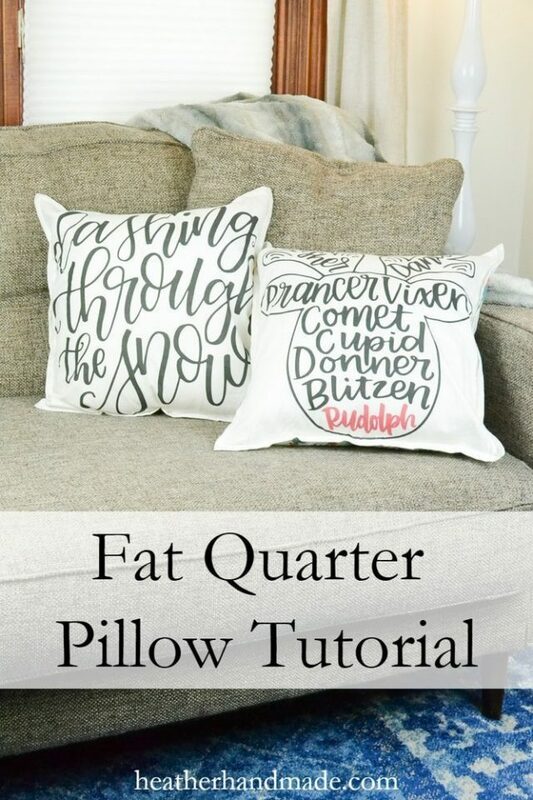 With two fat quarters you can make your own French seam envelope pillow with this Christmas pillow tutorial. I’m so excited to share a really cute and really easy french seam pillow tutorial with you today! 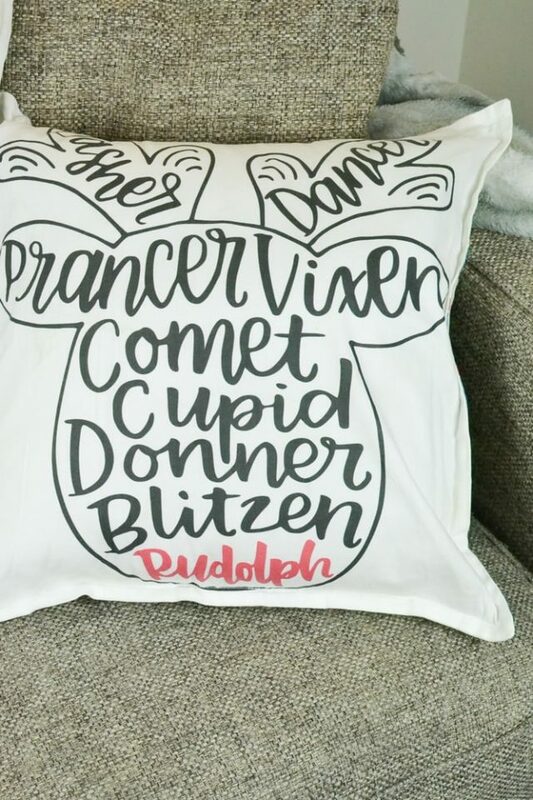 And it’s just in time for the holidays so you can make your own Christmas pillows. I wanted to make some holiday pillows since my kids are really getting into the holiday spirit this year. They were really excited about this holiday fabric from My Fabric Designs! 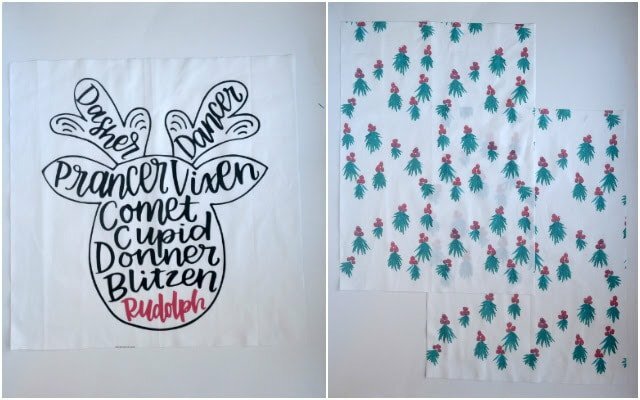 My sister (the amazing hand letterer) designed the holiday calligraphy fabric, and I designed the watercolor evergreen fabric. 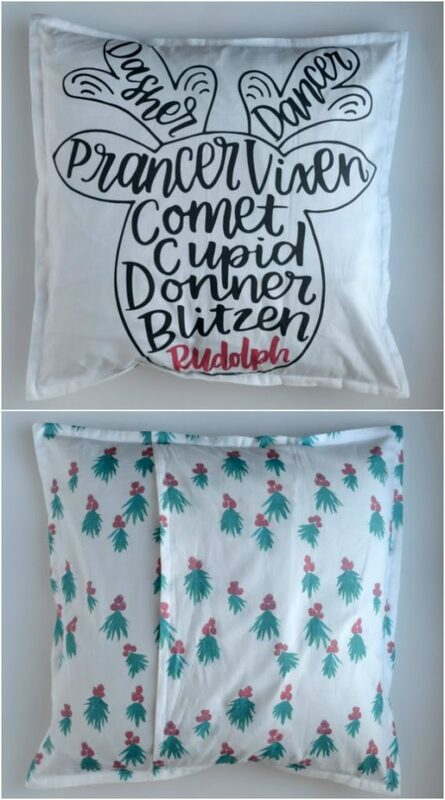 Well, let’s learn how to make these Christmas pillows! 1. Gather your supplies. 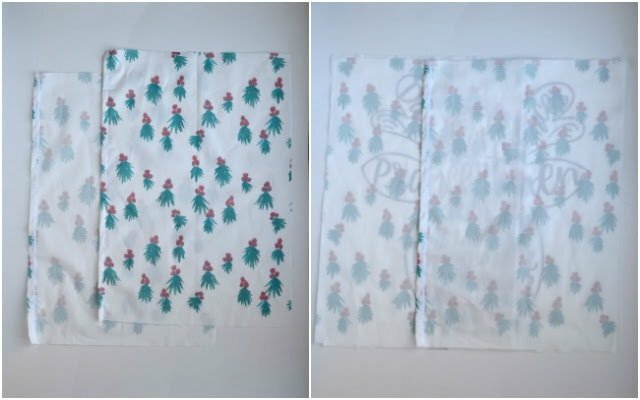 Wash and dry your fat quarters first. 2. Cut the front (the lettered fabric) 18″x18″. 3. Cut the back 18″ tall. Then cut the fabric in half widthwise. A fat quarter comes 21″x18″ so the two backs should be 10.5″x18″. 4. Hem one long side of each back. If your fabric is directional make sure you hem the opposite sides. 5. Lay the front right side up. Put one back right side down on top of the front with the hemmed edge towards the middle. Put the other back right side down on top of the front and other back with the hemmed edge towards the middle. The hems should overlap a couple of inches. 6. Sew all around the pillow with a 1/4″ seam allowance. Trim the corners. (My seams are serged, but you don’t have to serge at all. 7. Turn the pillow right side out and press edges carefully. 8. Sew 1/2″ around all the edges. This encloses the raw edges and makes a nice “frame” for the pillow. 9. Insert a pillow form and enjoy your pretty new pillow! 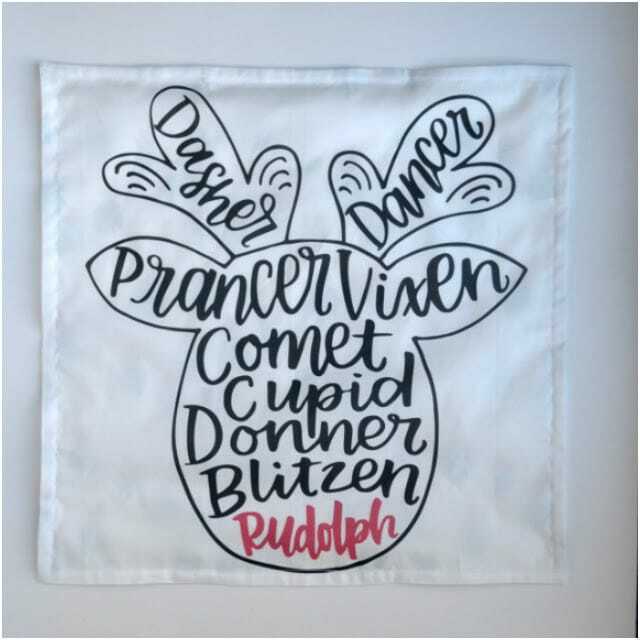 These holiday pillows are so fun and so festive! 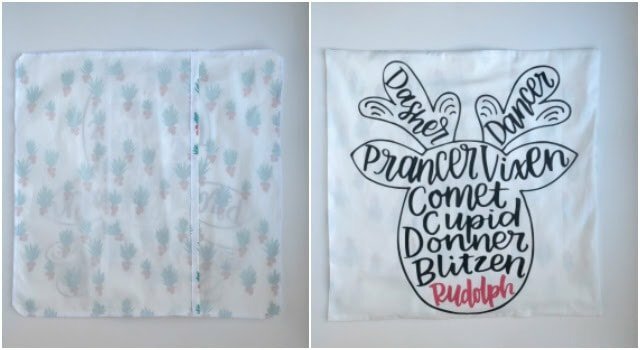 It’s a quick and easy Christmas pillow tutorial! If you make something using this French seam pillow tutorial, I’d love to see! Please share it on social media with the hashtag #heatherhandmade and tag me! I subscribed a while ago!! Such cute fabric! these pillows are fabulous!! I subscribed! Nice to meet you! 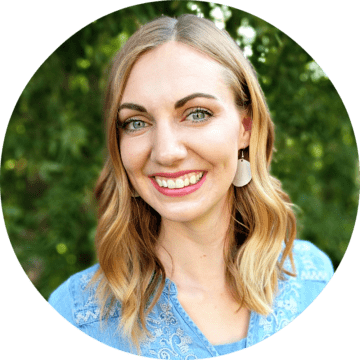 Heather "Feather" it's so wonderful to meet you via your blog and discover your creative self. 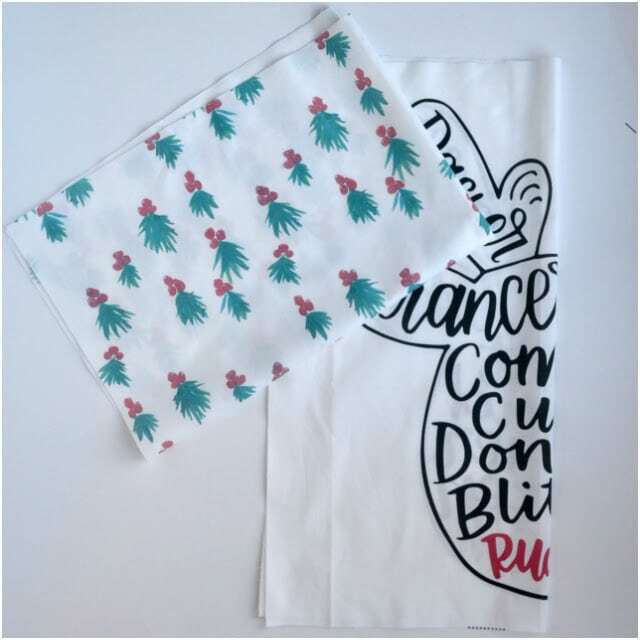 I'm now subscribed to your newsletter and look forward to some projects for baby nursery or toddler wear (new grandmom here:). Beautful family you have. thankyou so much for being so generous. You won the giveaway! Congratulations! I subscribed! Thanks for the chance to win. I subscribed (under a different e-mail than this commenting address (girlyj2727 at yahoo) thanks for the chance to win! I am now subscribed. Yeah! Thank you for being a part of the SMS Giveaway, sharing your tutorials with us and giving us the chance to win the best giveaway ever – a homemade pillow. To me that makes this even more special. Thank you for that and wishing you Happy Holidays. I subscribed. Thanks for the tutorial and giveaway! The pillows are so cute. I subscribe to your newsletter. Thanks for your tutorial. Love all the great photos as well. Your pillows are wonderful! I'm a subscriber. I am a new subscriber! love the pillows and thank you! I subscribed ! Thank you . I subscribed to your newsletter! thanks for the extra chance! I subscribed. And I notice you're in Centerville. I grew up next door in Bountiful! I'm in Philadelphia now but glad to see hometown connections pop up in my quilting world! Beautiful pillow and fun giveaway. Subscribed! What a cute little blog! I was searching "#utahblogger" on insta and found you! I love those pillows. So cute! I love the joy pillow, it would totally work in January.